This introduction highlights the paradox of the uses and regulation of public spaces by street trading reflected in two interwoven contradictions. The first contradiction is about the massive presence of street trade and the persistent ambiguous regulatory framework. The second contradiction deals with the misconception of street vending as an “unorganized” and “temporary” activity. It illustrates that vague legal and institutional frameworks as well as a hostile operating environment are drivers of conflictual uses of public space, such as streets that are partially fragmented and privatized by traders. This themed issue principally collects contributions from scholars who participated in the conference on “Urbanization and Street Vending”, organized after a series of forums in Kenya by the IFRA-Nairobi (Institut Français de Recherche en Afrique, http://ifra-nairobi.net/1099) on 9 and 10 November 2016. The authors express their gratitude to David Scott and Marc du Ry for the proofreading of this introduction. 1We introduce this issue by first highlighting the meaning behind pictures 1 and 2 chosen because they broadly illustrate some conflicting aspects of street vending which is such a common feature of the metropolises as well small- and medium-sized cities of Africa and South-Asia. Picture 1 shows street vending activities along Congo Street, Kariakoo area, in Dar es Salaam’s CBD and Picture 2 shows evening street vending in Commercial Street, in Thika Town’s CBD, located 40 km from Nairobi. The Congo Street photo not only illustrates the vibrancy of the street trading landscape with its multifarious forms and goods, but also the resultant congestion and inhibition of human and traffic flows. Mobile and immobile vendors (in makeshift structures), with various types of display, operate adjacent to the shops, either on the pavements or along the road itself. This complex interplay results in Kariakoo experiencing a mixed use of the commercial space where shop owners, wholesalers and street vendors compete with and/or complement each other to provide goods and services to customers. 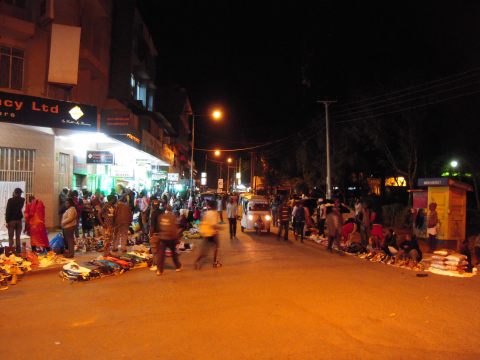 Unlike the street traders of Congo Street in Dar es Salaam who operate during the day, the street traders of Thika’s Commercial Street operate between 5pm and 9pm, mostly on weekdays. This is strategic because Commercial Street is surrounded by a number of public and private offices and the employees who work in these offices provide a ready market for the street vendors as they leave for home after 5pm. Furthermore, control by the city authorities is much less efficient during this period because enforcement officers generally also stop their daily duties at that time. Street traders move to the Commercial Street slightly before 5pm in the evening, “grab” the public space, and spread their goods on the pavement and parts of the road, largely to take advantage of their mobile customers. Incidentally, Commercial Street is only about a hundred meters from the Chief Magistrate’s Court and the Thika Law Courts. These streets are spaces characterized by flows of traders and of customers. As noted by Steck (2006), these flows are, on the one hand, a condition for the success of the business but cause street congestion on the other hand. 2In both Dar es Salaam and Thika street trading is carried out in the CBD’s public spaces even though these latter are not designated areas for trade. Therefore, street trading is outlawed and considered a violation of city by-laws as in most cities of the Global South (Roever and Skinner 2016). Cities are perceived as drivers of modernity, but street trading, which is part of the urban environment in Africa and in South-Asia, is considered as an unacceptable relic of underdevelopment and a manifestation of poverty; that is why its absence is generally viewed as progress (Bromley 2000). In addition, notably because it takes place in undesignated areas of public space, street vending is considered as an “informal activity” by city authorities who use “informality” as an argument to legitimize repressive actions against the street vendors (Potts 2008). Law enforcement against street vending oscillates between tolerance and brutal eviction and street vendors of the global South therefore operate in a highly hostile and at times dangerous environment. 3Despite these challenges, street trading retains a strong presence in the urban spaces of Dar es Salaam and Thika in full view of city authorities, and this is also the case in other cities of Africa and South-Asia as presented in various case studies in this issue; Accra, Cairo, Delhi, Kisumu, Mumbai, and Nairobi. There is no doubt that informal trading persists and continues to grow, providing a medium of exchange in the daily lives of a large segment of the urban population. 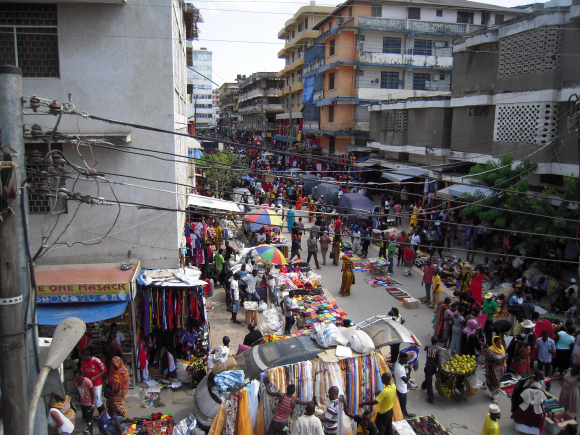 It is estimated that in the 2000s there were 700,000 street traders in Dar es Salaam (Lyons and Msoka 2010), 500,000 street traders in Nairobi (Lyons and Snoxell 2005), and about 400 street traders who appropriate Thika’s CBD streets during evening hours (estimation by Trade, Industries & Enterprise Development of Kiambu County in 2018). Street vendors make up 5 % of informal urban employment in India and between 12 and 24 % of informal urban employment in 7 cities of Western Africa and Antananarivo (Chen et al. 2016). Street trading activities are very much part of the urban landscape and economy as pictures 1 and 2 show. These givens challenge the consensual definition of informal activity as “income generating activities outside the regulatory framework of the state” by Castells and Portes (1989: 12). The pictures reveal that street trading is integrated at the center of commercial activity and it coexists through complex, dynamic and more or less inconspicuous interaction with formal trade as well as places of institutional power. 4A suitable working definition of “street trading” illustrated by the two pictures is inspired by Monnet’s (2006) definition of ambulantage (hawking). Street trading is a situation of economic exchange in a selling place characterised by its precarious occupation of public space and by the mobility of the traders and/or of the customers. Street trading is carried out in public spaces that are not specifically designated for trade, and as such, it enters into competition with other urban services such as traffic flow, access to buildings and other commercial activities in the city. Informal trading streets are mostly linear public spaces that are appropriated and occupied by street traders. In Dar es Salaam and Thika, as in many other cities of Africa and South-Asia, the conflicting interests and contested uses of public space result in conflicting rivalries of power in regard to the access and control of streets. Pictures 1 and 2 show that central urban spaces are appropriated by “informal activities” resulting in the congestion of those streets that are located close to city authorities; surprisingly, however, the legal regulatory framework surrounding street vending and informal activities is unclear. 5Arising from this discussion of the two illustrations and from the articles in this issue, we can identify the relation between the socio-economic benefits of informal activities and their undeniable presence in the cities on the one hand, and their lack of political recognition and clear regulatory policies on the other, as a paradox. Despite street trade being a source of employment for a large number of city dwellers, its political legitimacy is weak and it therefore operates in conditions of uncertainty and hostility. The paradox of the uses and regulation of public spaces by street trading is reflected in two interwoven contradictions. The first one is the contradiction between the prevalence of street trade as a most visible form of “informal economy” and the “obscure commitment” of the state through unclear regulatory frameworks based on the ambiguous concept of informality. The second contradiction is that street trade, labelled as an informal activity, is presented as a temporary, illegal and unorganized activity. Nevertheless, the informal economy has increased over the past four decades in the Global South (Charmes 2012). Additionally, there is often a misperception and presupposition that street vending always operates outside state regulation. In fact, the informal economy is essentially regulated through a wide range of actors and a multiplicity of rules and institutions (Meagher and Lindell 2013, Lindell 2010) as the collection of articles makes clear. 6The next two sections develop each of these contradictions with various examples and references to the articles in this themed issue to enable the reader to appreciate the paradoxical aspects of street trading. The last sections present the background of the research project and the highlights of the authors’ contributions to this themed issue. 7This section illustrates the contradiction between the undeniable socio-economic contribution of street trading on the one hand and the hostile operating environment and the ambiguous regulatory framework, which invokes the enigmatic concept of “informal activity”, on the other hand. The latter remains an ambiguous concept notably because informal activities, considered to be in opposition to “formal activities”, are instead inextricably intertwined with them (Brown and Lyons 2010, Charmes 2002, Lindell 2010, Racaud 2015). In order to address the permeability of informal/formal activities, state intervention, broader economic dynamics and private regulation, it has been proposed to understand informal activities as a “continuum of characteristics” (Benjamin et al. 2014). However, the two bounds of the “continuum” are still defined as “informal” at one end and as “formal” on the other so that the same paradigm based on the concept of “informality” is in play. 8Understanding the notion of ‘informal economy’ poses challenges. It reflects the tension between normative approaches and the complexity of specific and dynamic socio-eco-political situations. Academics insist on the relevance of locating definitions of the informal economy in specific contexts, notably the specific social norms, the specific relation with state regulation, and the relation to the broader economic environment (Hugon 2014, Lindell 2010, Potts 2008). The case of street trading is interesting in challenging the measurement criteria used when studying an informal economy and norms in public policies and development. For instance, Racaud (2018) and Steiler (2018) in this issue demonstrate that the institutional environment in Kenya and in Tanzania respectively prevents street traders from being licensed and therefore restricts them to the informal economy. Additionally, it is worthy of note that the acquisition of a licence is not a guarantee that the state will not evict vendors from the streets at a future date as illustrated by Spire and Choplin (2018) in the Accra case study. 9The above-mentioned examples challenge the norms of “informality”. The term “informality” remains a category of practice. Like other statistical indicators, it is an influential form of knowledge that depends on political agreements and value systems (Gadrey and Jany-Catrice 2016). The topic of street vending addresses divergences between a value system characterized by globalized norms of modernity and a modernity created by the actors at the bottom of the pyramid. Petty producers and petty traders “build modernity by reinterpreting rules, norms [...] while they modify them through more individualistic practices in their relations with elders or with new communities of membership” (Hugon 2014: 26). These complex dynamics can be overlooked when the puzzling concept of informal activity is used to achieve political objectives. 10The New Urban Agenda from the Habitat III conference in 2016 indicates that the informal sector ought to be integrated into the urban fabric in order to achieve inclusive governance (UN-Habitat III Policy Unit 1 2016: 22). Integrating the informal economy seems to mean “formalizing the informal”, an ambiguity addressed by Steiler (2018) in this issue. She argues that even if the concept of informal economy is contested and politically charged, it “continues to play a vital role in informing strategies of economic and social development on multiple levels of government” (Steiler 2018: 2). According to Kamete (2017), the recent policy measures geared towards integrating the informal urban economy into the mainstream economy are fundamentally flawed because “integration is reduced to a technocratic, depoliticized, and legalistic notion that is insensitive to the local context and the needs of the putative beneficiaries” (Kamete 2017:20). Many policies result in strengthening the informal economy as a category, contrasted to formal activity, whose only respectable destiny is to also become formalized. Otherwise, the informal economy can be grasped as a creation of the state, even if this is by default, because public policies, or the absence of public policies, contribute to its presence (Lautier 2003). The classification of “informal traders” is a political construction even though street trading is a prominent phenomenon in African and South-Asia cities. 11In addition to the definitional issues, what is at stake for street traders is the question of being an active part of society – that is, ordinary citizens as opposed to “conditional citizens” (Joshi 2018, this issue). There is no doubt that the question of their legitimacy is visible in the different perceptions about street vending and the informal economy. The discourse of illegitimacy/informality is still integral to the perceptions of street vendors. In Kenya, for instance, many of the street vendors construct their identity partly through their economic activity. When the latter is operated in an “undesignated area” and/or without a business license, they very often call themselves “hawkers”, irrespective of whether they are mobile or operate in a fixed location, which could be a makeshift wooden structure called kibanda. Their lack of control over the work place results in an identity characterized by a name perceived to be derogatory. The term “hawker” underscores how they perceive their precarious status. Yet, hawkers – informal traders – are entrepreneurs who undeniably contribute to economic growth. 12“Informal employment is the norm in the global South” (Chen et al: 331). In Africa, it is estimated that the informal economy contributes 50 to 80% of GDP, 90% of job creation (Benjamin et al. 2014), and 72% of non-agricultural jobs (International Labour Organisation 2018). Despite its scale and (discussed) role in reducing economic and social exclusion, local authorities still refuse to recognize street vending (Chen et al. 2016, Lyons and Snoxell 2005, Skinner 2008). A large majority of street traders operate without the corresponding necessary urban infrastructure such as appropriate premises and associated services for their activities. This casts doubts on the ability of the state to provide a conducive environment for street traders. Street trading lacks a clear regulatory framework and political recognition by the state, and this makes vendors vulnerable to harassment by city authorities (Potts 2008). 13Kenya is a good example that illustrates contradictions in the regulatory framework at different levels of power, between local and national government. In 2016, 89.7% of all new jobs in Kenya, excluding small-scale farming and pastoralist activities, were in the informal sector, and 83.1% of the population is currently engaged in the informal sector (Government of the Republic of Kenya 2017). The informal sector and micro-enterprises are recognized and presented as sectors which should be supported, as indicated in the ‘Kenya Vision 2030’ national development plan: “The informal sector must be supported in ways that will raise productivity and distribution and increase jobs, owner’s incomes and public revenue” (Government of the Republic of Kenya 2007: 10). Moreover, two national texts, namely the Micro and Small Enterprise Act from 2012 and the Urban Areas and Cities Act from 2012, “promote the development of informal commercial activities” (National Council for Law Reporting 2012: 18). However, local by-laws contradict these national legal texts. The absence of a clear legal regulatory framework for informal sector activities therefore originates in contradictions between the national Acts of Parliament and city-level by-laws – often leading to conflicts between the street traders and city authorities. The conflicts can take various forms, with the most common being crackdowns and forceful eviction of street traders from the streets, especially in the CBD, as shown in pictures 3 and 4. Crackdowns on street traders are an everyday practice in the urban management of street trading spaces (see further Dragsted-Mutengwa 2018, this issue). 14In Nairobi, as in other cities in Kenya and elsewhere, local authorities use local by-laws to legitimize their repressive policies, with street traders facing regular police harassment and evictions, which in turn increases the informal nature of street trading (Roever and Skinner 2016). This highlights a paradoxical aspect of street trading: repressive policies against street trading increase the informality of street vending. For instance, Racaud (2018, this issue) shows that the eviction from an “informal” market in Kisumu (Kenya) in 2014 resulted in the traders moving from the demolished market to the streets of Kisumu’s CBD. Therefore, the State plays a role in the development of the informal economy. 15In many cases, urban authorities associate street trading with chaos, congestion and insecurity as they share the presupposition that this sector is disorganized and unregulated. Yet, depending on their specific contexts, large numbers of street traders are members of organized groups that negotiate with urban authorities on a varying basis. For instance, there are many street trader associations, often in the form of self-help groups, as well as advocates for the rights of street traders (Brown and Lyons 2010). Interestingly, these formal associations registered by the authorities are engaged in street trade, which is perceived to be in the “informal sector”. Street vending activities further encompass several internal organizational and operational rules to which street vendors adhere, including the areas of operation, membership in vendor associations, the times of operation, and the tools of trade. 16“Informal” trading streets often have high levels of throughput of people (see also picture 1) whose flows are a precondition for vending success. Additionally, there is high demand for trading space along these streets leading to competition among the street vendors. For example, Linda, a street vendor in Congo Street, in Dar es Salaam, started as a mobile trader – machinga – by selling plastic bags (Racaud and Raphael 2016). With time, he obtained access to a trading space along Congo Street, which he uses as his base of operation. According to Linda, getting an operating space has become very difficult due to congestion. The professional trajectory for new street traders is likely to be as follows: they start as mobile hawkers, moving around with their goods along the streets. With time, they occupy negotiated spaces left behind by street traders leaving the business or those who have moved to other locations. The established street traders know the specific locations where each trader operates from, creating a sense of ownership of the street space shared between them. In Congo Street, traders themselves allocate trading locations, so that in a sense the “informal” actors regulate themselves. Moreover, whereas street vendors occupy public spaces on a temporary basis, some of them have operated in these spaces for decades. For example, Linda started his business in Congo Street in 1991. This shows that street trading is not a temporary business activity because he has worked as a street vendor in the same place for about 30 years. Linda, along with other street traders, embodies the long-term vulnerability of the informal economy as investigated in a number of empirical studies gathered in this themed issue. 17The modes of access to, and control of, these informal trading streets illustrate the conflicts and power rivalries that are the object of divergent representations and uses. Established street traders tend to “own” and “control” spaces in the streets, while new traders will tend to be mobile because of lack of space. Traders therefore compete for access to a trading place in a context where street trading is growing as a result of the globalization of exchanges and consumption, in the North as well as in the South (Monnet 2006). Streets combine the functions of traffic flows and commercial activities with housing as provided by the surrounding buildings. This combination of several functions can result in conflicts, particularly if space is scarce, leading to increases in value (functional and symbolic). Indeed, conflicts can occur between city authorities involved in regulation of trade and space (generally inspired by modern planning) and street traders, between formal traders (shop owners) and street traders, and also between street traders themselves as their numbers increase (Benjamin et al. 2014, Chen et al. 2016). The growth of competition in street trading translates into greater tension around access and usage of space in these streets, especially in the most strategic locations such as the CBD or close to transport nodes with high volumes of pedestrian traffic. 18Although competition is stiff, some informal traders have made attempts to organize themselves into groups in order to make their voices heard (Brown and Lyons 2010, Lindell 2010). Joshi (2018, this issue) argues that the political struggle by several street traders’ groups has, over the years, contributed to the vote for a national law in India legalizing street trade and to new possibilities for negotiating with the state at several levels. One can link these movements with the right to the city approach (Lefebvre 2009 , Mitchell 2003, Samara et al. 2013) because street traders denounce their exclusion from public space and claim their place within the city. The right to the city constitutes a framework for the re-enunciation of development issues such as access to urban services (Morange and Spire 2014: 2). The Habitat III Conference held in 2016 emphasized the right to the city as a new paradigm for urban development. However, instead of referring to the specific activity of street trade, the UN-Habitat III Policy Unit 1 paper (2016) still refers to the ambiguous and politically charged concept of “informal workers”. Although street traders are highly visible in most cities’ CBDs in Africa and South-Asia, they remain invisible in the development policies. 19While agitating for their rights to the city, street traders’ organizations in Africa do not hesitate to invoke their national constitutions that guarantee their right to work (Benit-Gbaffou 2016). International non-governmental organizations such as WIEGO (Women in Informal Employment: Globalising and Organising) and StreetNet (Street Vendors Alliance) reinforce the voices of street traders. Together with the International Labour Organisation, these networks campaign for a more inclusive and integrated approach to street trading. However, street traders’ organizations face challenges in terms of membership, legitimacy and financial resources in a context of political rivalry and competition for space. The rivalries of power and leadership competitions are addressed in several papers of the themed issue (see, for example, Bouhali 2018, Racaud 2018, Sales 2018, Spire and Choplin 2018). 20The two contradictions above were examined through an action-research project undertaken in Kenya in 2016, spearheaded by IFRA-Nairobi and other partners. The initial question of the project was: How can street vending, an individual and a collective resource, be integrated into the urban governance? 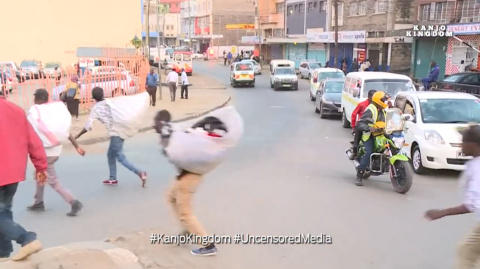 This question came about because in the City of Nairobi, street traders faced ongoing harassment by the enforcement authorities, although the sector provides jobs and daily income for a large part of the urban population. The project organized two forums in Kenya (Kisumu and Nairobi) and an international scientific conference. Their objectives were, first, to share and to reflect on various representations and practices from different kinds of stakeholders, and, second, to develop a common point of view in regard to street vending by considering it not as an urban problem, but as an activity that can be integrated into the socio-economic fabric of the city. Above all, the participants sought to address the gap between the socio-economic legitimacy and the political recognition. 21Some significant results from the two discussion forums and the conference showed that the legal and institutional frameworks are a major factor of differentiation between the different case studies even if most of them emphasized the manifold conflicts in street trading environments, between street traders, local authorities and formal traders, but also between street traders themselves. Street trade governance involves power relations, solidarity practices and fluctuating convergences of interests that fit into specific contexts. It was also clear that the definitions of “street trade” and “informal activity” are a major challenge and that appropriate definitions should be situated in specific contexts. In many case studies presented in this issue, street vending continues to operate within an ambiguous institutional framework resulting in a regime of uncertainty. 22This themed issue principally presents contributions from scholars who participated in the conference. The paradox of street trade, that is, the weak political legitimacy of a major urban socio-economic activity, enables us to read the contradictory aspects of street vending governance and of its more or less conflicting integration into urban politics. 23The collection of articles in this themed issue presents case studies from Algeria (Bouhali 2018), Egypt (Bouhali 2018), Ghana (Spire and Choplin 2018), India (Joshi 2018, Sales 2018), Kenya (Dragsted-Mutengwa 2018, Racaud 2018) and Tanzania (Steiler 2018). Ilda Lindell (2018) as well as Alison Brown and Peter Mackie (2018) support their argument by literature and extensive research in several urban contexts in Africa. The articles brought together in this issue illustrate in detail that urban deadlock (particularly the lack of employment), unclear legal and institutional frameworks, and a hostile operating environment are drivers of conflictual uses of public space, such as streets that are partially fragmented and privatized by traders. In this multidisciplinary collection most of the articles originate in field-based empirical studies, mainly from geographers but also from anthropologists and scholars working in the field of development studies, with a bias towards qualitative approaches that favor comprehensive reasoning. Furthermore, this issue blends and puts into perspective both Francophone and Anglophone literature. Whereas most of the case studies are situated in sub-Saharan Africa, three articles contribute to perspectives from Northern Africa and India. The legal and institutional frameworks and the local arena of power may be the major factors of differentiation between these case studies. The themed issue shows that “informality” is clearly an ambivalent political and social construction, inserted into specific and dynamic contexts of development and modernization. 24Ilona Steiler (2018) demonstrates that while the negative connotations of the concept of informal economy continue to cast street trade as a deviation from the norm of formalized economic activity, its usage distracts from the causes and conditions of street trade and leads to a narrow focus on business regularization, with disastrous consequences for traders and city authorities. Through the case study of Dar es Salaam, she demonstrates the ambiguity in the conceptualization of formal/informal activities whereas the dualism of the legality/illegality of informal trading masks the blurring of the distinction between them in reality. She demonstrates factors that deter the informal traders from seeking to regularize their business activities due to limitations on financing and flexibility in the use of street space. Formal businesses require a permanent structure to be licensed, which would involve greater expenses to street vendors in terms of rent and other fees. She indicates that by equating legality with regularization, the regulations turn the use of public space by unlicensed street traders into a criminal offence. Steiler also highlights how the varying oscillations in the interpretation and application of laws on the use of public space and the regulation of street vending depend on the political situation and the perceptions of government and city officials. The paper demonstrates the lack of clear guidelines in the regulation of street vending. 25Sylvain Racaud (2018) dwells on the ambiguities of the legal and institutional environment regulating street vending, with Kisumu City in Kenya as his case study. As for Dar es Salaam, a clear definition of a street vendor is lacking. In this case, the city permits the registration of semi-permanent informal sector traders and charges the informal traders daily fees. The paper additionally outlines the lack of coherence between national and local policies in regard to street vending. National laws/policies, including Kenya’s vision 2030, seek to promote micro enterprises and the informal sector, which also encompass street vending. Racaud further highlights the contradiction of using street space, which is a public good, for private activities. The contestation and competitive use of public space by diverse actors creates the potential for conflict between street vendors and the city authorities and passers-by on the one hand, and among the street vendors themselves on the other. 26In India, the paper by Kunal Joshi (2018) outlines the role of the state, which, out of a growing concern about the “informal trading street”, became involved in street trade regulation with a national law permitting street vending in the country in 2014. Joshi demonstrates that by institutionalizing a right to vend, the campaign that led to the bill has created new possibilities for vendors to negotiate with the state at all levels. What is at stake is essentially a contradiction between the private interests of a wide range of actors and several conceptions of “public interest”, the latter being also a political construction. He demonstrates the potential of street vendors to advocate for their rights and push for progressive national policies. Joshi additionally outlines the levels of political negotiation, both at the local level with the police and municipal workers (characterized by extortion and bribery), and at the national level, through the street vendor associations pushing for reforms in the sector. 27Dragsted-Mutengwa (2018) elaborates on the hostile relationship between street traders and the city enforcement officers in the City of Nairobi in an attempt to rid the city of street traders and to live up to an ideal of a clean and modern city. Street vendors are perceived as “outsiders” who constitute a nuisance in the city. Dragsted-Mutengwa shows that crackdowns against street vendors in Nairobi create a platform for exchanges (in the form of bribes) as street vendors “buy” their freedom when threatened with arrest. She also highlights the influence of politics in the governance of street vending, as when in the run-up to elections, harassment of street vendors is suspended, while politicians promise reforms to street vending which are never implemented. 28Spire and Choplin (2018) show how the city management of Accra has used beautification and decongestion as a justification for relocation of street vendors from strategic parts of the city. The authors tackle the political conflicts and clientelist relations in the competition for leadership in a new public market in Accra that accommodates former street traders. They highlight the tensions and coping strategies of the street vendors as they are relocated to the Odorna market, and additionally the reconfiguration of the power relationships between vendors, city dwellers and urban authorities. The authors show that the Odorna “market is a miniature replica of the numerous stakes involved in the governance of street vending” (p. 9). 29The dynamic interrelations between “informal traders” and the state are uncovered by Anne Bouhali (2018) who focuses on the negotiations for street space in Cairo and in Oran. The paper analyzes the unsettled and often tense relationships between street vendors and urban authorities in their struggle for control of public space and, through it, the control of the city at large. It highlights the complex power relationships between street vendors and formal/official traders as they compete for customers. She argues that street vendors have known how to benefit from the weakening and/or the weakness of urban authorities and have been able to negotiate their place and their presence in the public space. 30Lola Salès (2018) explores the ordinary practices, and the social, political and spatial “tactics” and “strategies” employed by street vendors to access and capture public space at the time of the introduction of the Street Vendors Act in India. She examines the different forms of law at work in the streets of Mumbai, i.e. the transgressions, the fixes and the negotiations, but also the new applications of legal tools in these conflicts. Her paper looks more generally at “the right to the city” by investigating the processes of inclusion and exclusion of inhabitants with regard to their access to the resources of urban space at the time the Street Vendors Act was implemented in Mumbai. 31Ilda Lindell’s (2018) paper addresses the prospects for, and limitations of, transformative and sustained collective organization and representation among street workers. It reflects upon the role of various internal and external processes that influence the dynamics of street workers’ organizations. It looks at whether street workers’ associations have the potential to contribute to progressive social and political transformation and to what extent they are able to advocate for the concerns of street workers. The findings show that the nature of street vending in terms of the spatial dispersion of workers and their varying degrees of mobility constitutes one of the key challenges in forming street vendor associations and ensuring continuing participation by members. 32Brown and Mackie (2018) examine the broader political landscape of street trading in Africa and its influence on the operations and vulnerabilities of street trade. The authors use three axes: the colonial legacy and politics across borders, the politics of repression and accommodation, and the political voice, to examine the influence of politics in street vending. The authors note that political structures and power vary over time, which partly explains the tenuous and short-lived nature of the more lenient governance approaches towards street traders. Colonial legacy and the post-colonial evolution of governance and power have significant and lasting impacts on urban street trade, both on trade networks and legal urban frameworks and practices. The authors highlight that street vendors have the potential for political negotiation through improved strategies of organization and representation. 33This collection of articles highlights the complexity of street trading, which involves power relations, solidarity practices and a fluctuating convergence of interests in a context of enduring political uncertainty. Public policies are ambivalent and generally influenced by a neoliberal ideology, for instance, in giving the private sector (street vendors) a leading role in street regulation. The private sector is also heterogeneous and the class of street traders is not uniform; in some cases, street traders are divided through their competition for leadership. In addition, contradictions and unclear legal frameworks allow room for more inconspicuous strategies in the search for access and control parts of public spaces. The ambiguities in legal and institutional frameworks are sometimes exploited as a resource by actors in key positions, particularly those acting as an interface between street traders and the city authorities. In other words, whilst street vendors take advantage of the weak legal and institutional environment to negotiate their place and presence in public spaces, law enforcers take advantage of these loopholes to extort and take bribes from the street vendors. This may appear as a paradox: the claims by private actors for public space can be interpreted as demands for the privatization of public space although the latter is represented as a (limited) common good. Whereas most authors in this themed issue advocate a more regulated economy (at least in the informal trading street), reverse trends towards deregulation, such as the increasing “Uberization” of the economy, may undermine these efforts. Benjamin N, Beegle KG, Recanatini F, Santini M. 2014. Informal economy and the World Bank. Policy Research Working Paper No. WPS 6888. Washington DC, World Bank Group. Bouhali A. 2018. Negotiating streets and space in transnational trade marketplaces in Oran (Algeria) and Cairo (Egypt): ‘place struggle’ in the commercial city. Articulo – Journal of Urban Research 17-18, https://journals.openedition.org/articulo/3369 (Retrieved November 12, 2018). Bromley R. 2000. Street vending and public policy: a global review. International Journal of Sociology and Social Policy 20(1/2): 1-28. Brown A, Lyons M. 2010. Seen but not heard: urban voices and citizenship for street traders, in Lindell I. (ed.) African Informal Workers. Collective Agency and Transnational Organizing in Urban Africa. London, Zed Books: 33-46. Brown A, Mackie P. 2018. Politics and street trading in Africa: developing a comparative frame. Articulo – Journal of Urban Research 17-18, https://journals.openedition.org/articulo/3612 (Retrieved November 12, 2018). Castells M, Portes A. 1989. World underneath: the origins, dynamics, and effects of the informal economy, in Portes A, Castells M, Benton L (eds.) The Informal Economy. Baltimore, Johns Hopkins University Press: 11-37. Charmes J. 2002. Les origines du concept de secteur informel et la récente définition de l’emploi informel. World Development Report Background Papers. Washington DC, World Bank. Charmes J. 2012. The informal economy worldwide: trends and characteristics. Margin: The Journal of Applied Economic Research 6(2): 103-132. Dragsted-Mutengwa B. 2018. Street traders and “good officers”: crackdowns as a relational form of urban governance in Nairobi. Articulo – Journal of Urban Research 17-18, https://journals.openedition.org/articulo/3391 (Retrieved November 12, 2018). Gadrey J, Jany-Catrice F. 2016  Les nouveaux indicateurs de richesse. Paris, La Découverte. Government of the Republic of Kenya. 2007. Kenya Vision 2030. Nairobi, Government of the Republic of Kenya. Government of the Republic of Kenya. 2017. Economic Survey 2017. Nairobi, Government of the Republic of Kenya. Hugon P. 2014. L’ « informel » ou la petite production marchande revisitésquarante ans après. Mondes en développement 166: 17-30.
International Labour Organization. 2018. Women and men in the informal economy: a statistical picture. Geneva, International Labour Office. Kamete AY. 2017. Pernicious assimilation: reframing the integration of the urban informal economy. Southern Africa. Urban Geography 39(2): 167-189. Lautier B. 2003. Les limites de l’économie informelle comme alternative à la mondialisation libérale. Revue du MAUSS 21: 198-214. Lefebvre H. 2009 . Le droit à la ville. Paris, Anthropos. Lindell I. (ed.) 2010. African Informal Workers. Collective Agency and Transnational Organizing in Urban Africa. London, Zed Books. Lindell I. 2018. Street work: dynamics and trajectories of collective organizing. Articulo – Journal of Urban Research 17-18, https://journals.openedition.org/articulo/3670 (Retrieved November 12, 2018). Lyons M, Snoxell S. 2005. 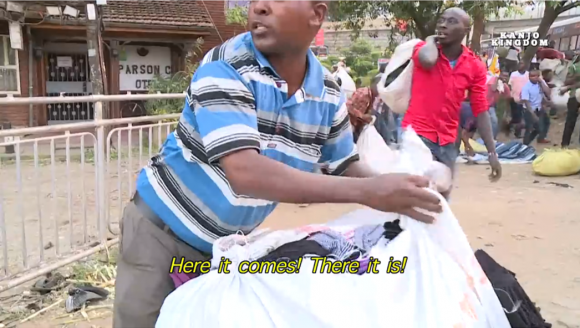 Creating urban social capital: some evidence from informal traders in Nairobi. Urban Studies 42(7): 1077-1097. Meagher K, Lindell I. 2013. ASR forum: engaging with African informal economies: social inclusion or adverse incorporation? African Studies Review 56(3): 57-76. Mitchell D. 2003. The Right to the City: Social Justice and the Fight for Public Space. New York, Guildford Press. Monnet J. 2006. Le commerce de rue, ambulant ou informel et ses rapports avec lamétropolisation: une ébauche de modélisation. Autrepart 39: 93-109. Morange M, Spire A. 2014. Le droit à la ville est-il soluble au Sud? Métropolitiques 22, https://www.metropolitiques.eu/Le-droit-a-la-ville-est-il-soluble.html (Retrieved July 11, 2018). National Council for Law Reporting. 2012. Urban and Cities Act. Nairobi, NCLR. Potts D. 2008. The urban informal sector in sub-Saharan Africa: from bad to good (and back again?). Development Southern Africa 25(2): 151-156. Racaud S, Raphael C. 2016. Circulations of Chinese Products, Street Grabbing and Booming Market Places: Linking Villages and Cities in Tanzania. Paper presented at Rural-Urban Connections in Sub-Saharan Africa Conference, Copenhagen, 25-28 January. Racaud S. 2015. Chasing after a pair of Chinese sandals in Cameroon: Actors and places of Chinese junks on commercial roads. Articulo – Journal of Urban Research 12, https://articulo.revues.org/2899 (Retrieved June 12, 2018). Racaud S. 2018. Ambiguous resource: “informal” trading street in Kisumu, Kenya. Articulo – Journal of Urban Research 17-18, https://journals.openedition.org/articulo/3702 (Retrieved November 12, 2018). Roever S, Skinner C. 2016. Street vendors and cities. Environment and Urbanization 28(2), http://wiego.org/publications/street-vendors-and-cities (Retrieved June 16, 2018). Salès L. 2018. The Street Vendors Act and the right to public space in Mumbai. Articulo – Journal of Urban Research 17-18, https://journals.openedition.org/articulo/3631 (Retrieved November 12, 2018). Samara T, Shenjing He, Guo Chen. 2013. Locating Right to the City in the Global South. London, Routledge. Skinner C. 2008. Street Trade in Africa: A Review. Manchester, WIEGO. Spire A, Choplin A. 2018. Street vendors facing urban beautification in Accra (Ghana): eviction, relocation and formalization. Articulo – Journal of Urban Research 17-18, https://journals.openedition.org/articulo/3443 (Retrieved November 12, 2018). Steck J-F. 2006. La rue africaine, territoire de l’informel? Flux 66-67: 73-86. Steiler I. 2018. What’s in a word? The conceptual politics of ‘informal’ street trade in Dar es Salaam. Articulo – Journal of Urban Research 17-18, https://journals.openedition.org/articulo/3376 (Retrieved November 12, 2018). UN-HABITAT III Policy Unit 1. 2015. HABITAT III Policy Paper Framework 1 – The right to the city and cities for all. New York, United Nation.